and Bibles were quite rare. get Bibles in my land. can't get them in their hands. Though he was only twelve years old, young Brother Andrew (1928 -) snuck out late at night, passing our secret messages during World War II to help his native Holland break free from Nazi occupation. Following war's end, Andrew fought eagerly for his country in the Dutch East Indies and then, returning to Holland, discovered a new life of adventure transporting Bibles to countries where they were strictly forbidden. Despite danger and uncertainty, Brother Andrew and his international ministry, Open Doors, continue to take Bibles to closed-off countries throughout the world. 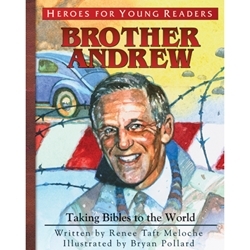 Now Heroes for Young Readers makes Brother Andrew's remarkable story available in this picture book all ages will treasure.